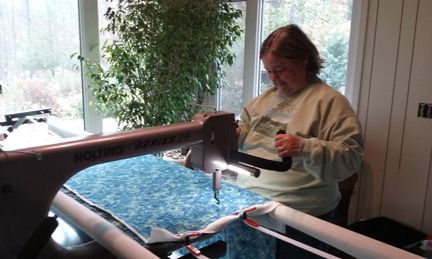 As a Nolting Longarm dealer, I have received many calls over the years for longarm help and advice. The calls can be broken down into two categories, (1) mechanical, such as broken needle, timing, or frame problem, and (2) stitch quality and quilting problems. Tension issues seem to top the list over all. bobbin and top tension will NOT solve the problem. In other words, when there “seems” to be a tension issue, there can be one of a number of other reasons causing the tension to be unbalanced. When you find that adjusting the bobbin and/or top tension are not helping, then you need to look further to see what the real reason is for the poor tension. Here is a check list of some common issues that can cause poor tension. Some of these can be corrected by adjusting the bobbin or top tension, but for most of these, the problem must be corrected. thread form the stitch in the middle creating a balanced stitch. When quilting, this is in the batting. Poor tension is defined as an unbalanced stitch with either the top thread or bottom thread laying on the fabric surface or railroading. Railroading is when the top thread is pulled below the backing or the bobbin thread is pulled through to the top of the quilt. Poor tension never looks good and can even be felt with the fingers. The flat line thread can be felt, and railroading feels bumpy. When the tension is balanced, both the top thread and bobbin thread will pull slightly into the batting giving the quilt texture. The fingers feel a slight indent in the backing and top and the thread feels smooth. Poor quality batting. Regardless of what you pay for batting, if the batting is inconsistent in thickness, you are asking for problems. Batting that is inconsistent in thickness will be thick in places and very thin in places. In the thin areas of this type of batting, there simply is no place for the top and bottom thread to form a stitch. As a result, the stitch is pulled to either the top or bottom of the quilt. Sample testing tension of two different battings. next to a poly (unknown brand) that varied in thickness from very puffy to so thin you could see your finger prints. 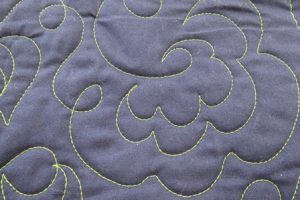 I FMQed (free motion quilted) feathers and other designs across the sample without making any tension adjustments. Results: The tension was perfect on the Quilter’s Dream batting top and backing, but varied from acceptable to poor to unacceptable on the inconsistent thickness poly. In poor places the thread laid on the top of the fabric and in unacceptable places there was railroading (the top thread totally pulled to the bottom). 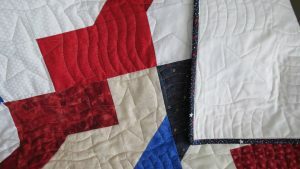 Purchasing the best quality, same consistent thickness batting is a small investment to make to assure quality stitching, a quality quilting job, and time spent without frustration trying to constantly make tension adjustments. Poly batting (left) very thin, Quilter’s Dream (right) consistently same thickness. 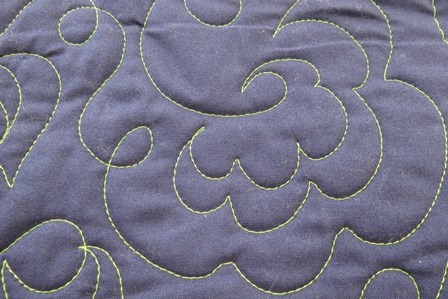 Nice even, well defined stitching on the Quilter’s Dream consistently same thickness batting. 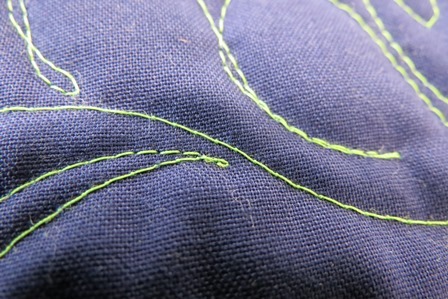 Poly sample with railroading (see pokes of top thread), flat line thread laying on fabric, and a few places where the stitches are sell defined. With inconsistent thickness batting, tension changes quickly from good to bad. Needle. The machine needle is a very important part of a successful quilting equation as poor tension can result from a number of needle issues. 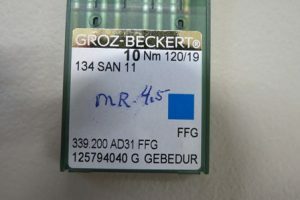 “light ballpoint” needles from Groz-Beckert. Look for FFG on package. “FFG”, the needles are titanium coated, and are SAN 11. (these work with Nolting L and M hook machines) To avoid damage to your longarm, make sure the numbers match the needles required for your machine. Needle incorrectly inserted in the machine. For a perfect stitch to form, the hook point must pass behind the needle in the scarf (indentation) to pick up the top thread loop as the needle starts pulling up. If the needle is inserted backwards (will likely hear clicking), or turned slightly to the left or right, the thread loop will not be in the correct spot to be picked up by the hook, or will be picked up too soon, or too late, causing the tension problem. Dull needle or damaged needle. Needles do wear out. In fact, the point on them wears down much faster than you would think. I have often solved a tension problem by simply changing the needle. The reason is that a dull needle has trouble penetrating the fabric resulting in a delay in delivering the top thread at the optimum time for a balanced stitch. Always change the needle every 8 hours of quilting. Remember, too, that even a new needle might be defective. If you are experiencing problems, replace the needle. Needle too small for thread. A needle that is too small for the thread being used does not have a deep enough groove on the front of the needle to carry the thread through the quilt sandwich. As a result, there is a delay, or even non delivery of enough thread to make the loop. When the thread loop is not picked up at the right moment, the thread tension will not look right. It is always better to over size the needle rather than undersize the needle. Yes, the slightly larger needle will leave a little larger hole, but the holes will close up. The higher the number on the package, the larger the needle and the larger (wider and deeper) the groove. Quilt sandwich too tight on the frame. Remember that the machine is constantly moving in different directions as you quilt. It does not stop moving as each stitch is made. 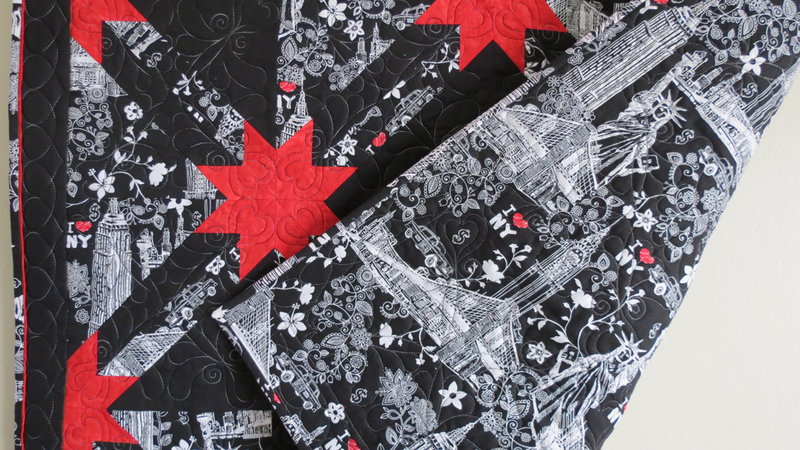 As a result, the needle will flex as it is going up and down through the quilt sandwich. 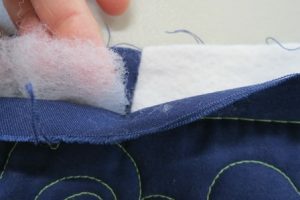 If the quilt is loaded too tight on the frame, there is more needle flex displacing the position of the top thread loop, often causing what appears to be a tension problem. Loosen the quilt roller on the frame one or two cogs. You should be able to see the throat of the machine moving under the quilt. Quilting too fast. Just because we can make our longarm machines go fast doesn’t mean we should. Do you rush your brownies baking in the oven 10 minutes instead of 25? It takes time for the brownies to bake to the right doneness. The same is true for quilting. The faster you go, the more needle flex and the more likely there will be what looks like tension problems. Slow down and enjoy the journey. Thread quality. Poor quality thread and thread not designed for machine quilting can be weak, inconsistent in thickness, have slubs, or even be knotted part way through the cone. Using poor quality thread or thread not meant for machine quilting could result in thread breakage which can cause broken needles, scratches to the hook and pricks in or around the needle hole from a broken needle, and could even knock the machine out of timing. This is in addition to the thread not performing causing what looks like a tension problem. Always select thread that is labeled for machine or longarm quilting. These threads are designed with extra strength for the rigors of machine movement as well as running through the machine and stitching three layers together. Type of batting and thread. Battings and threads are made from different types of fibers. Some battings and threads are more abrasive than others. This wears on the needle eye and point and can result in needle penetration problems and poor stitch quality. Realize that every quilt is a different set of variables. With each quilt project, start fresh with a new needle sized for the thread being used. Sometimes a particular thread will be more difficult to use with some battings, causing the thread to “drag” creating tension problems. If the particular thread combination (top and bobbin) is not working with the quilt sandwich, try a different thread. The weather. 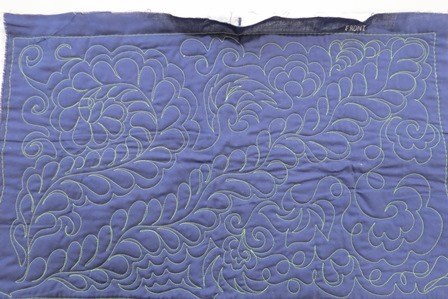 Do you have more tension problems quilting in the summer than during the winter? It could be the humidity. Cotton can absorb up to 40% its weight in moisture, right from the air. The quilt top and backing is usually cotton, the batting is often cotton, as well as the thread. As the temperature outside and inside goes up, the air can hold more moisture and the relative humidity goes up. The science principle of substances moving from where there is more to less holds true here. The moisture in the higher moisture air moves to the lower moisture cotton fabric, batting and thread. As the cotton absorbs moisture, the fibers swell. Thread may not flow as easily through the machine or needle eye and the fabric and batting may resist the stitching, all of which may cause what looks like tension problems. Solution: Keep batting in the package until ready to use. Fluff it up in the dryer on no heat. Run a dehumidifier, especially if your studio is in a basement, or run the air conditioning which typically removes moisture from the air. 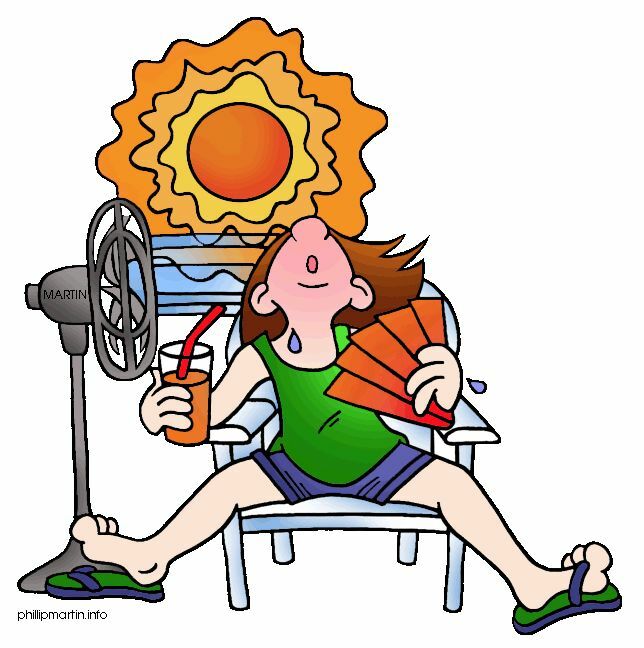 If you had no problems yesterday and today everything is the same with the same quilt and same thread, but the tension is terrible, run the dehumidifier or air conditioner, wait a day or two, then try again. When the humidity goes back down, everything will work better. I have experienced this problem as have other quilters. If you are feeling uncomfortable from the humidity, your quilt is, too. Tension problems can be very frustrating. Even becoming comfortable adjusting the bobbin and top tension can take time. It is important to realize that there are many factors that can affect the creation of the perfect balanced stitch. The next time you run into a tension problem and adjusting the bobbin or top tension doesn’t work, take time to go through this list and analyze what might be causing the problem. Yesterday we delivered a longarm to a customer upgrading from a 17″ throat to a 24″ throat machine with more options and ergonomic, adjustable handles front and rear. The machine used, only a few years old, but I had sent it back to the Nolting factory to have them go through and make sure everything was as it should be. When the machine arrived back from the factory I put it on a frame and stitched with it to make sure I was satisfied with everything. At the delivery we replaced the short frame arms and short carriage rails with longer ones (an easy upgrade with Nolting frames) to accommodate the 24″ throat Pro and put the machine on the frame. My customer had practice fabric and batting ready to load so that I could train her in the use of her “new” machine. We basted the batting and top onto the backing and started stitching. The basting stitches worked well, but when we started sewing we occasionally got a long stitch, sometimes half an inch long, other times much longer. In addition, we noticed that it always seemed to be a vertical stitch (front to rear). 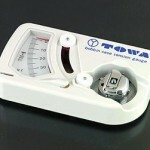 Before we started we used the Towa Bobbin Tension Gauge to set the correct bobbin tension for the M-hook (200 to 225 for the Nolting machine), then adjusted the top tension for a balanced tension. As the tension was OK, we knew we could rule out tension as the problem. The clue we focused on was the vertical long stitch. Skipped stitches vertically could indicate a problem with the encoder on the side of the machine, so we replaced the encoder and made sure that the encoder wheel made good contact in the carriage rail. Hoping this would solve the problem we tested again, and again the same long, skipped stitch. Working through a list of possible causes for skipped stitches we (1) changed the needle, but that didn’t correct the problem. (2) Made sure the quilt sandwich was level and only a finger width of space under the take-up roller, and loosened the quilt sandwich slightly as both of these could cause skipped stitches. Again, same problem of long, skipped stitches. Knowing that this machine had stitched perfectly several months ago when it came back from the factory, we had to look at other possible causes. Again focusing on the long, skipped stitch, we realized that it only happened when the machine was moving away from the front of the frame toward the back of the frame. It is important to slow down and analyze everything carefully when something like this is happening. The customer had put a fine thread in the top, something to consider. But, the key was moving the machine toward the back. Needle flex will happen with longarm machines, even with a larger, sturdier needle. The machine had a MR 4.5 (size 19). But the other factor was, one of the fabrics was a batik which, because of its high thread count, can be challenging to stitch. possibility, so we decided to check the timing. After taking off the throat plate and rotating the hook to the correct position we found the timing position correct, but the hook was a tad too far from the needle. We are talking a very small distance too far away, but enough to see day light between the needle and hook. We adjusted the hook distance, put everything back together and tested stitching again. SUCCESS!! The machine stitched beautifully and there were no long, skipped stitches. Diagnosing and trouble shooting issues with longarm machines can sometimes be challenging because there are a number of variables involved. To diagnose, find the root problem, and solve it, each of those variables must be considered and evaluated. When diagnosing, rather than jumping to a conclusion, I think it is important to consider every possibility and to work through those, starting first with the things that can easily be checked and changed (changing needle, adjusting tension on the quilt top, etc) and moving to other possibilities until the cause has been found. For these reasons, I have included a comprehensive chart type trouble shooting guide in my book, Guide to Quilting with Your Nolting. Although written for Nolting owners, this guide provides helpful information on the various aspects of longarm quilting (beneficial to all longarm quilters), free motion and template quilting, a maintenance and repair guide for Nolting machines, the trouble shooting guide which covers issues common to all longarm machines, and many tips, hints, and resources. Click to buy the Guide now. Issues like this are inevitable. Rather than panic, analyze carefully what is happening, when it happens, take into consideration the thread, batting and fabric you are using. Then, go through a list of possible causes checking out each one until you find the problem. Often there is something you can do to correct the problem, but if not, you can tell your dealer or the company tech what you have already tried as they work to solve the problem. With sewing machine advances in the last 20 years or so, we have come to rely on the machine’s automatic tension setting. Because the machine has a preset automatic tension setting, we assume that the tension will always be perfect. This is not necessarily the case. This question was posed to Superior Threads wondering if machines with a preset tension ever need the tension adjusted, this is their response. Because we are used to the preset tension on our home machines and our fear of messing things up by adjusting tension, many longarm quilters are hesitant to adjust the tension on their longarm. And, Once they get it adjusted, they don’t want to touch it. Stitching with a longarm system presents several variables which are likely to change from quilt to quilt, or even within the same quilt, such as the type of batting, various types of fabrics with different thread counts, and the thread. From one quilt to the next, changing just one of these factors is likely to change how the machine stitches and as a result, the tension may not be as perfect on this quilt as on the last one.The solution is to become comfortable with adjusting the tension on the longarm. Regardless of whether you want to or not, get over it. You must become comfortable and confident in adjusting the tension on a longarm. What is balanced tension? The tension is balanced when the top thread and bobbin thread form the knot in the middle between the quilt top and quilt back, in the middle (batting). M-hook. Once the bobbin tension is correct, then you only change the top tension to achieve a balanced tension. If you change to a different thread in the bobbin, the bobbin case tension must again be adjusted to the same settings (as used for your specific hook) before adjusting the top tension to achieve a balanced tension. By far, the biggest learning curve in longarm quilting is becoming comfortable adjusting the tension. 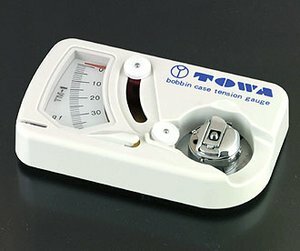 Find out what bobbin tension your longarm will operate best at, use a Towa Bobbin Gauge, if necessary, to make sure the bobbin tension is consistently the same with each type of thread, then adjust the top tension until the top and bobbin thread are in balance. The video below offers more information on why a bobbin gauge should be used and how to use it correctly for best results. Order the gauge.